"hi employers, we are two lady me and my cousin is available on weekend to do housekeeping. Or general cleaning at home office, store, condo, and ect. 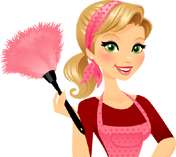 We are very fast and and with9 yearsof experience in cleaning houses. Asking a very afordable price per hour. Pls contact me if you are interested, i provide references if you ask. Phone is 6478398281. Here is the list what we clean. Clean and organized garage if you ask. If you have another things yo clean up just ask and we can clean it. "